Nabil Abu Rudeineh, the official spokesman for the Palestinian Authority (PA) in Ramallah, rejected the insistence of Justice Minister Tzipi Livni (HaTnua) on Saturday night that Israel had expected the PA to make concessions in return for the fourth batch of terrorists being released. 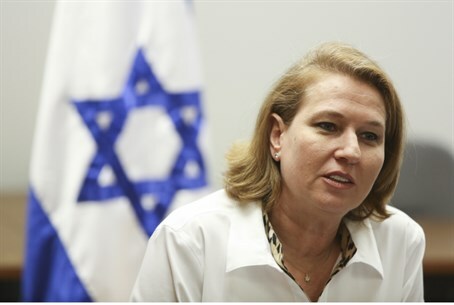 Livni told Channel 2 over the weekend that the fourth batch of terrorist releases had still been offered to the PA - but at a price. "I clarified to the Americans and the Palestinians we wouldn't release Israeli prisoners unless it were under a different context," she said. "That's why we wanted to create this (framework), which among other things included the extension of negotiations." Livni said the PA leadership "decided not to wait any longer" and went ahead with applications for international treaties - a move she described as "a violation and big mistake, that will make it difficult to get back to a normal state of affairs." Abu-Rudeineh rejected this, and stated in a press interview that Livni, by virtue of being the Chief Negotiator for Israel during ongoing peace talks, knew full well that the American-PA framework would include a fourth batch of releases as long as the PA did not apply for membership in international organizations. The spokesman then blamed Israel for the talks' failure, claiming that Israel's continuing to build in Jewish areas of Jerusalem, Judea and Samaria constituted a provocation against the PA and that it reneged on releasing the terrorists. He said that Mahmoud Abbas remains committed to "serious negotiations" to bring a just and comprehensive peace, end the occupation and establish an independent Palestinian state with its capital in East Jerusalem. Ongoing controversy over the failing peace talks stems around the fourth batch of terrorist releases, as MKs point out that the previous releases have done nothing to further talks, and that several of the released terrorists have contributed to the increase in terror attacks over the past year. PA Chief Negotiator Saeb Erekat stated last month that Abbas was staying in talks solely for the sake of the terrorist releases, prompting Israeli officials to reconsider completing the deal - which has always been contingent on real progress in the talks. After a dramatic series of negotiations, Israel officially cancelled the fourth release of convicted Arab terrorists on Thursday and issued harsh sanctions on the PA over the bid for legitimacy. In response, the PA issued a number of extreme demands against Israel, including the release of over 1,000 terrorists and a withdrawal to 1949 Armistice lines - essentially demanding concessions on all key issues before negotiations even continue.